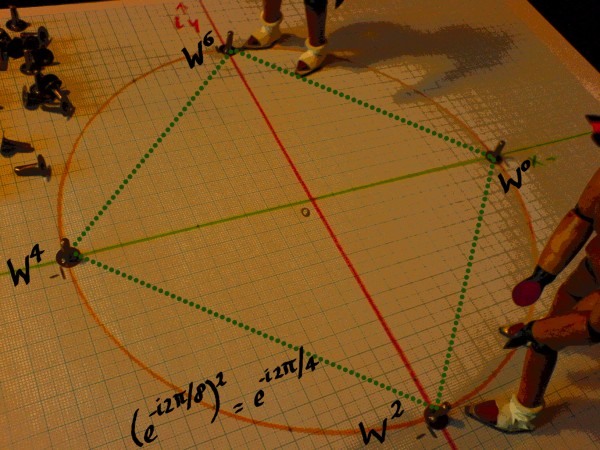 We are going to decompose the Fourier matrix into three sparse matrices of the form that was sketched earlier. 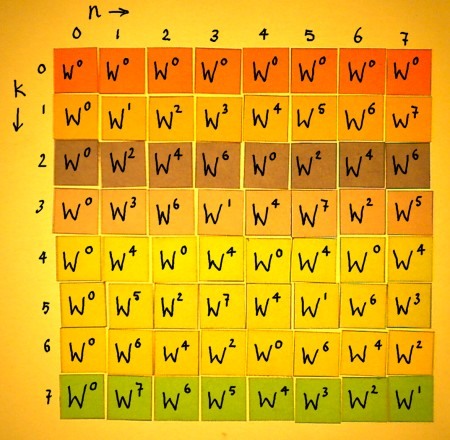 Recall that these were aggregates of identity matrices at different resolutions. 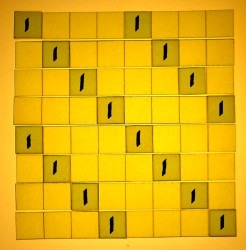 On the left is an aggregate of 16 1x1 identity matrices, in the middle we have eight 2x2 identities, and the right matrix is composed of four 4x4 identities. All these identities must be replaced by Wkn powers. Somehow. Well for the moment it is better to think in terms of roots instead of powers. My page Roots of Unity demonstrated how a whole set of Fourier harmonics can be generated while multiplying and adding merely the 'octaves', which are related to each other as squares and square roots. This is a phenomenon that we can use for the matrix decomposition. The square root of the square root is the fourth root. 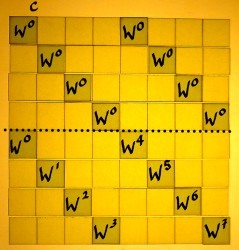 Expressed as powers of W=e-i2pi/8, the fourth roots of one are: W0, W2, W4 and W6. Taking the square root of the fourth root we land at the 8th root finally. 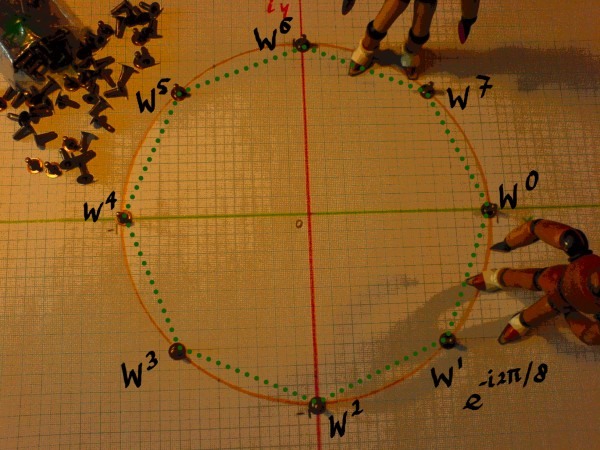 For N=8, we can not go further than this. There is still one important series missing. 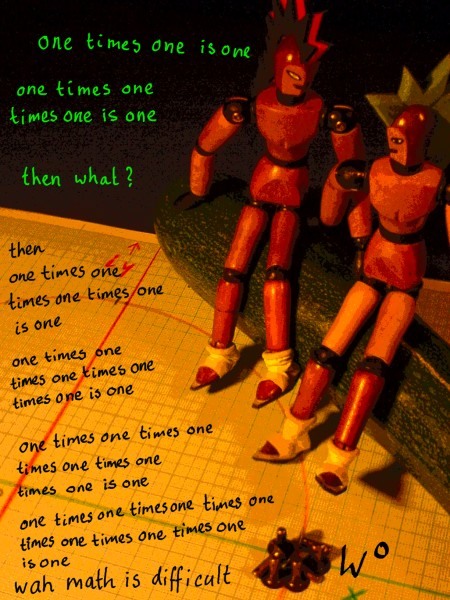 It is the first root of unity, or 11/1, and it's powers. That sounds quite trivial indeed. 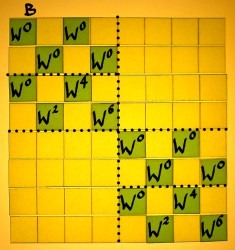 But the fact that W0 operates as an identity follows from our definition of W as being a complex root of unity. I feel we should remain aware of that. 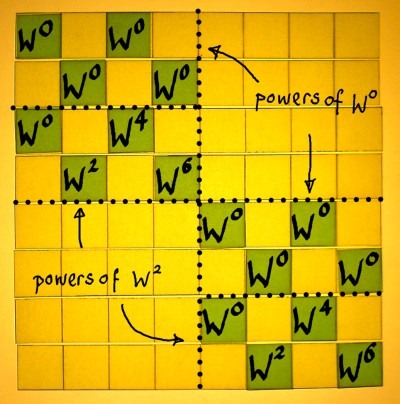 W0 is the most-present root in the Fourier matrix. It's power series dominates the FFT. 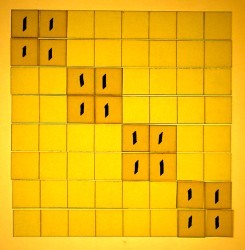 The series forms an identity with respect to rotation. It is a conservator of frequencies. 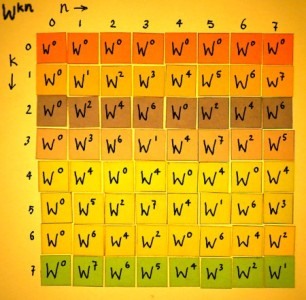 The question is now, how are we to arrange these frequencies in our N=8 sparse factor matrices? Sure this can be derived from the DFT formula, using a sequence of equations. These are fairly complicated however, and I always lose track at some point when studying them. Otherwise, there are these butterfly schemes that accompany most texts on FFT. But I am not a fan of that either. Maybe it is an idea to translate an FFT butterfly scheme to a matrix representation. 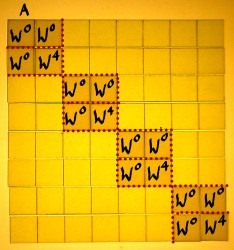 When we consider the next sparse factor as a repetition of the process at another resolution, then we see the W0 series on top again. 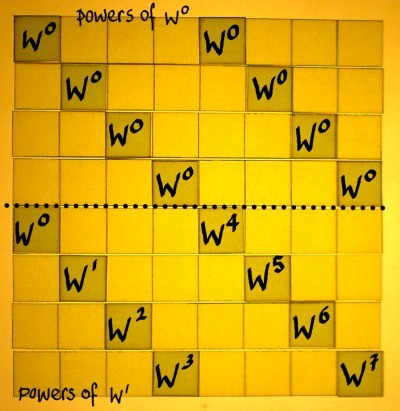 Powers of W2 are in the lower halves. W0, W2, W4 and W6 are the fourth-roots of unity here. 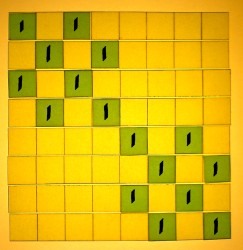 And here is the third sparse factor, it is the last one for the N=8 case. 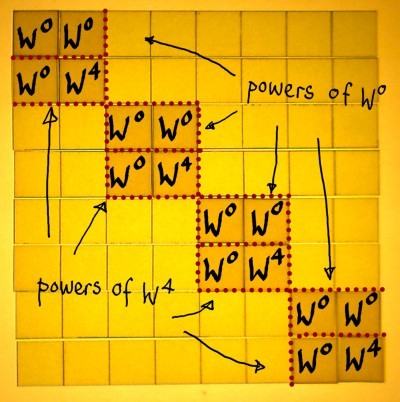 We find the W0 and W4, square roots of unity, in the lower parts of the small submatrices. From these matrices, you could already have the impression that it will split output results into smaller and smaller vectors in every stage. 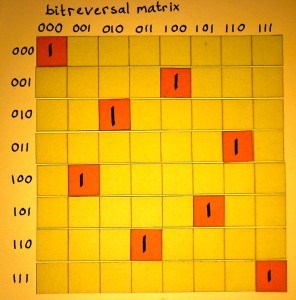 The upper half of each submatrix has merely identities summed, while he lower half has rotations. 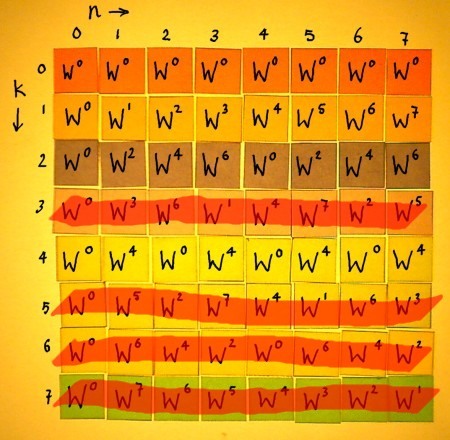 Let us now verify whether these sparse matrices multiplied will really render the complete Wkn matrix. 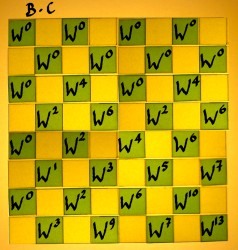 First multiply B with C to get BC. 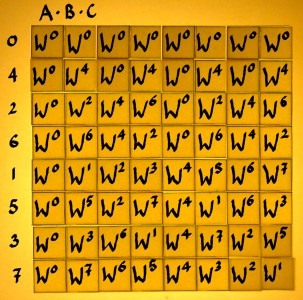 Some of the entries have exponents above 7, and these are to be computed modulo 8. 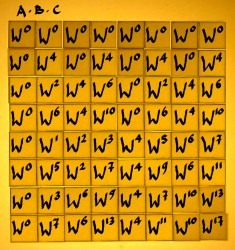 Below we have ABC in a form which can be compared with the Wkn matrix. Hey, it is interesting: all harmonics are present in ABC, but they appear in the wrong order. Actually, they appear in so-called bitreversed order. If you would use the sketched FFT factors for correlation, the spectrum would appear in decimated or downsampled form. The decimation is an inherent aspect of this FFT process. It happens stepwise: a factor 2 downsampling in each stage. The most efficient solution is to just let it happen. At the end of the process, it can be compensated with a bit-reversed permutation operation, if needed. 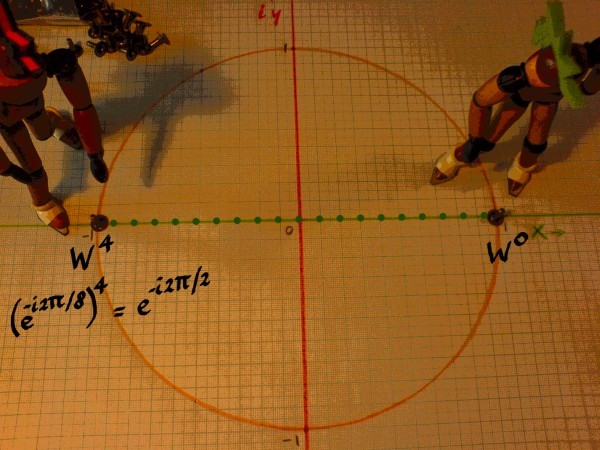 The Fast Fourier Transform as sketched on this page can easily be expanded to larger N, if only N is a power of two. It is a radix 2 FFT. Radix means base of the numeral system, and it is the Latin word for root. Radix 2 is only one of the many options for FFT, and even for radix 2, different schemes are possible. I am not going to discuss these alternatives yet, because we are not even ready with our simple example. It can be further decomposed, increasing efficiency one more time. That is for the next page.